About three years ago, I decided on a whim to become an expert soup-maker. It seemed like both an attainable and a noble goal–aside from being super useful! I would now call myself a soup-expert; blended soups, stewy-soups, broths, cold, hot, ramen-y, I’ve made ’em all, and can throw together some pretty great options with a reasonable amount of ease. Thank goodness it’s turning cooler and there are lots of squashes and hardy veggies available and appetizing again–though my mom makes a mean gazpacho, but it’s never been my jam. Melt some butter and olive oil in a pot (I use my 4-qt dutch oven); add one chopped onion and some garlic, if you like it. If you’ve got some celery and/or carrots that need to be used up, throw them in with the onion (chopped, of course). Let those “aromatics” get soft, and maybe even a little bit brown (i love the flavor when onions get burnt around the edges, so sweet!). 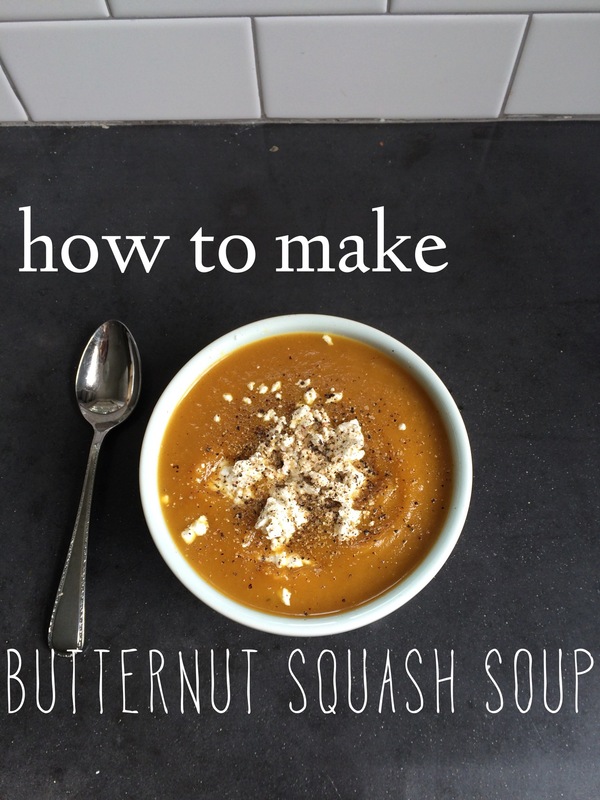 Depending on when you’ve finished chopping the butternut squash (could be 1-2 pounds, or larger–whatever you’ve got; could also be a sweet potato or a few, instead! ), throw it in and let it get a little color, too. If your other veggies are already pretty far gone, add 1/2 – 1 cup white wine and scrape up the delicious bits of veggie and juice stuck to the bottom of the pot, and then add the squash. Once all the vegetables are in with the wine, add chicken broth (or vegetable broth–or whatever gluten-free broth you want–I make my own, so I know what’s in it) to cover the vegetables by about an inch. 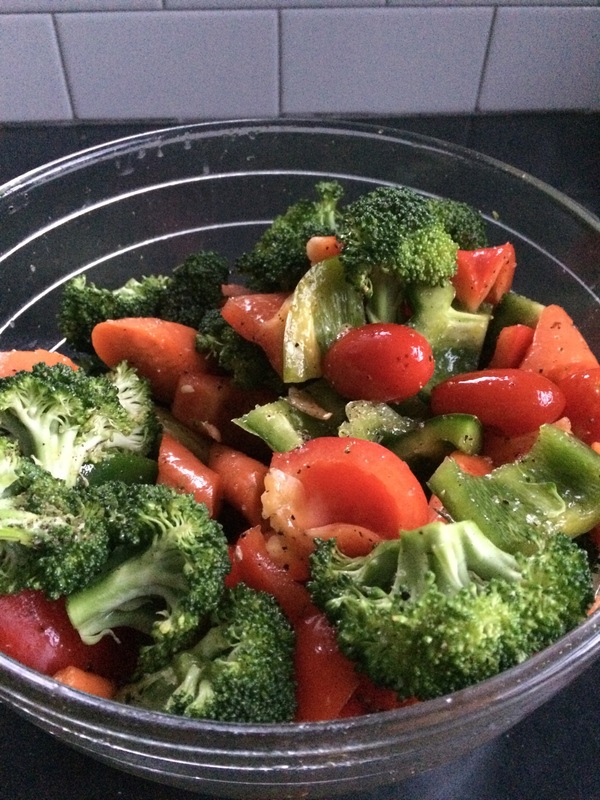 Add salt & pepper, and if you’re feeling wild, about 1 tablespoon curry powder. You could throw in thyme instead, or rosemary–especially if you’ve used sweet potatoes. Let the soup simmer till the squash is tender (when you poke it with a knife, it easily yields), and then let it cool a bit. Either use an immersion blender (highly recommended) or a usual blender (in batches, so that the top doesn’t fly off!) to make a smooth soup, and then serve with goat cheese & more S&P, or ladle into bags or tupperware (or ice cube trays!) to freeze (if you use ziploc bags, lay them on a cookie sheet–they’ll freeze flat and then you can stack them for efficient storage!). 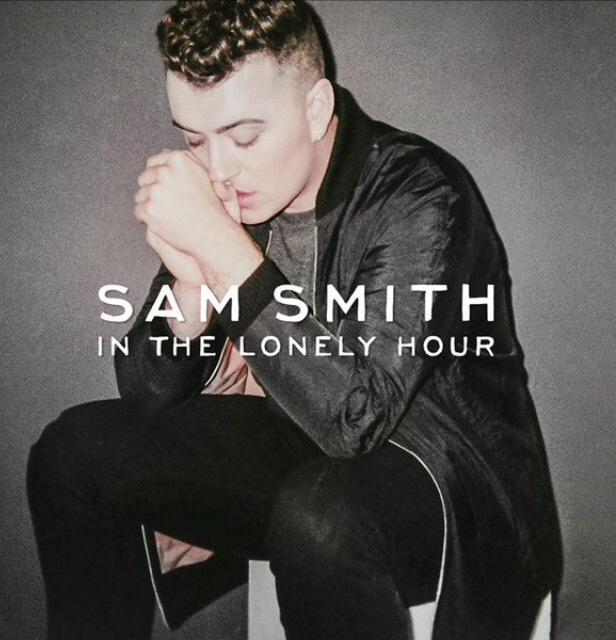 This man’s music has been the soundtrack to an intense week. Having started listening to him (inspired by NPR) when I was traveling this summer, his music is an instant pick-me-up. 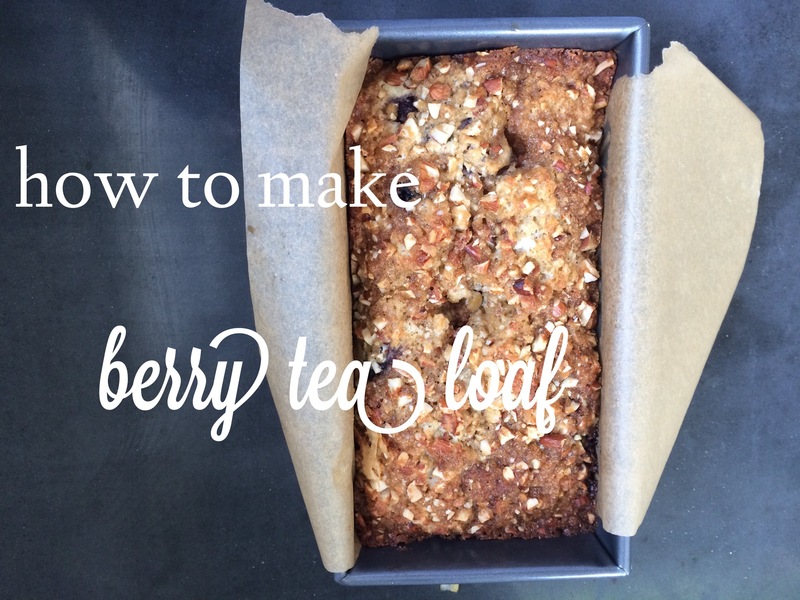 They can sort of pass for quick bread, but they’re really more like cake–tea loaves are the best. They’re the perfect thing to enjoy with an afternoon cup of tea. Without fail, I use this recipe. 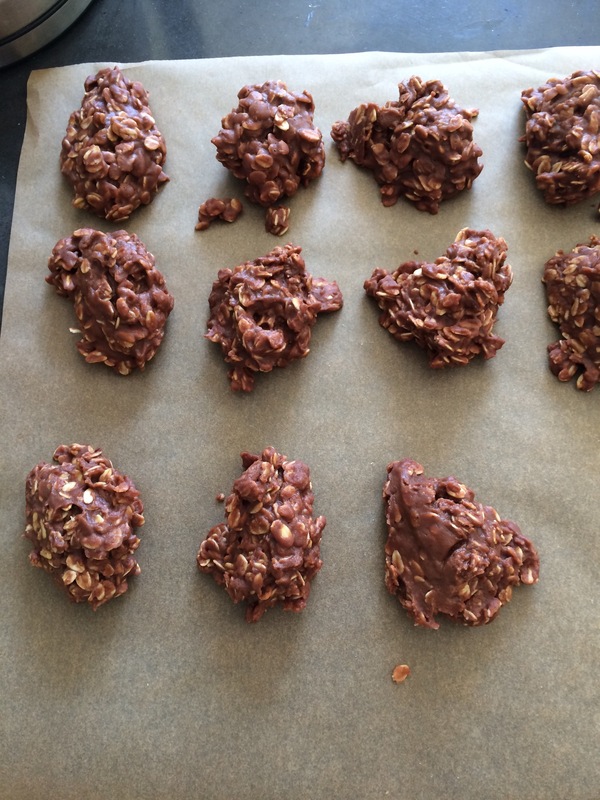 Though, this one, full of chocolate, is a major fave, too (From BAKED EXPLORATIONS). And PUMPKIN BREAD, from a few years ago, on this blog (originally inspired by a Greek teacher of mine from college–he’d make it for us on test days). It’s one of those simple pleasures. Last week, I bought some leeks. I thought perhaps I’d make some soup, but it was in the mid-to-high 90s every day. With vegetarians coming over to dinner and red potatoes languishing in my pantry, I was once again inspired by France. 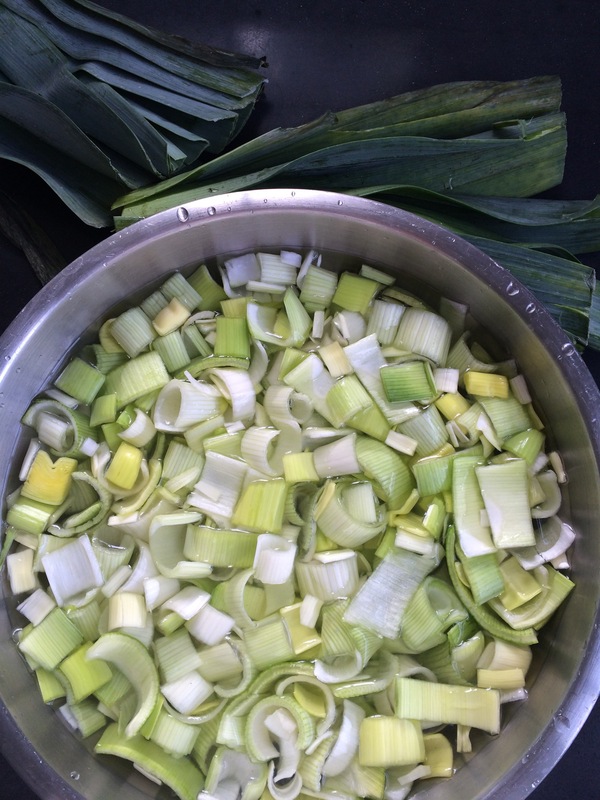 Leeks are delicious members of the onion family, though they are also famous for catching and keeping dirt. Once chopped, one or more water baths with much swooshing is necessary to release the grit trapped in between the many layers. Heat a tablespoon each of olive oil & butter in a skillet at medium heat, add 2 chopped and cleaned leeks, and cook till soft–about 10 minutes, stirring occasionally. 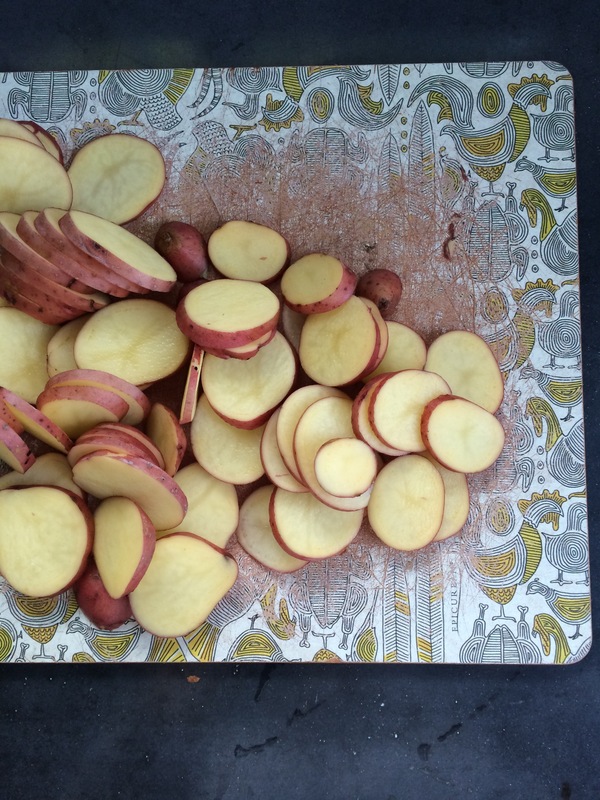 While the leeks cook, slice 8 ounces small potatoes. I believe that good is not the enemy of perfect (or I try to live as if I believe this), and so I keep pie crusts from Trader Joe’s in my freezer. 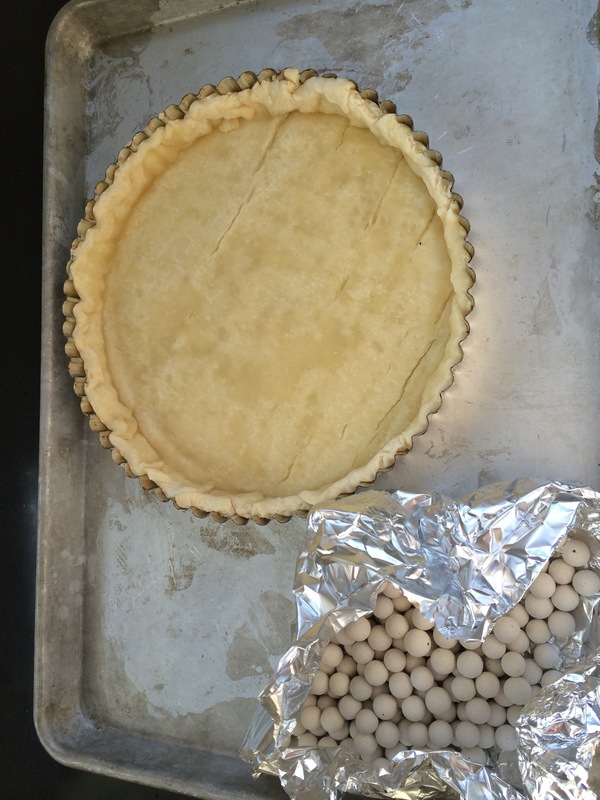 De-frost, press into a tart pan (or pie dish, or even a 9-inch round cake pan), lay down a layer of foil or parchment, and pour some rice, dried beans, or fancy pie weights into the middle of the crust (to keep it from putting on airs and getting all bubbly while it bakes). Bake in a 375 degree oven for 10 minutes. Remove the rice/beans/weights, and let the tart crust cool slightly. Add potatoes to the leeks in the skillet, along with about 2/3 cup liquid–some cream, some wine, some broth–whatever is on hand and sounds desirable. Season with salt and pepper, and some thyme or parsley or sage or rosemary–anything that seems Frenchy and that happens to be fresh. For me, today, it was thyme. I even threw a few sprigs on top of the tart for good measure. 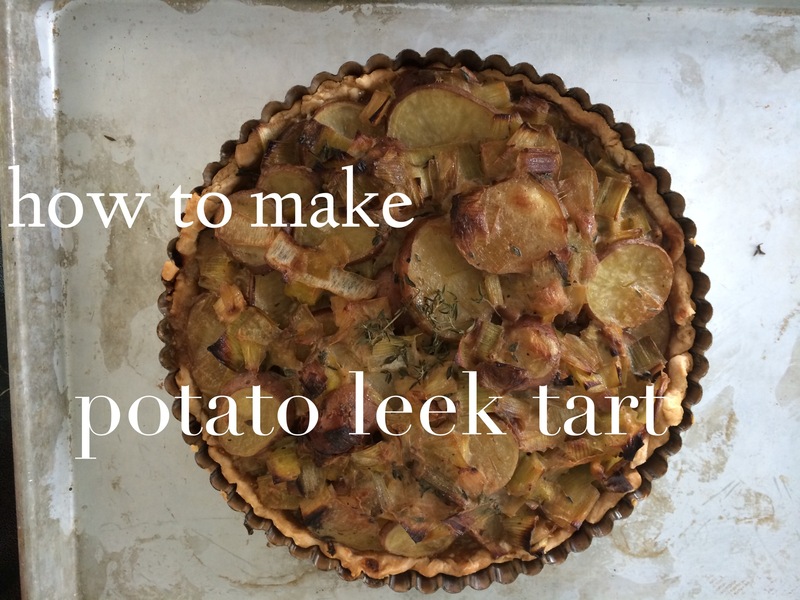 Add the potato-leek mixture to the tart crust and spread evenly. Sprinkle with cheese if desired (I meant to, and forgot). 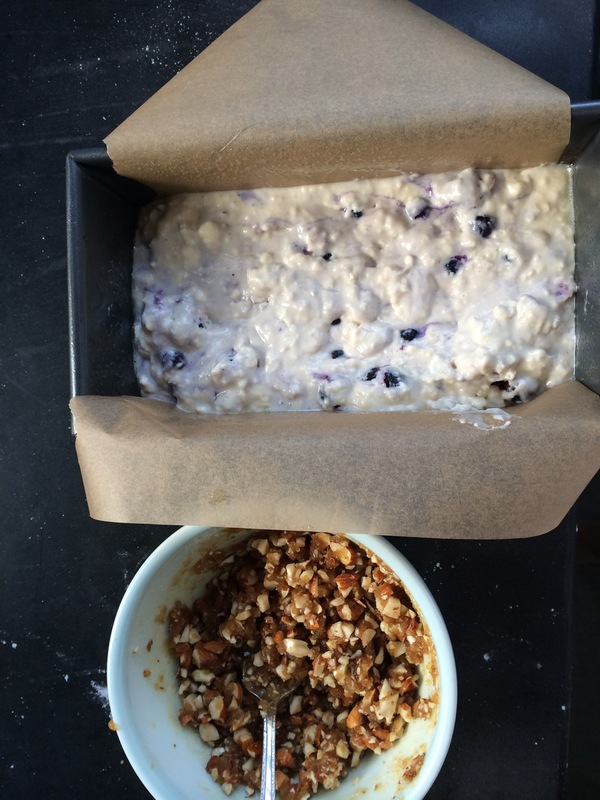 Bake for 35-45 minutes at 375 degrees. Because of the temperature outside, I served this room temperature–you can also serve it warm. With a little vinaigrette & some greens, it’s a perfect lunch or dinner. 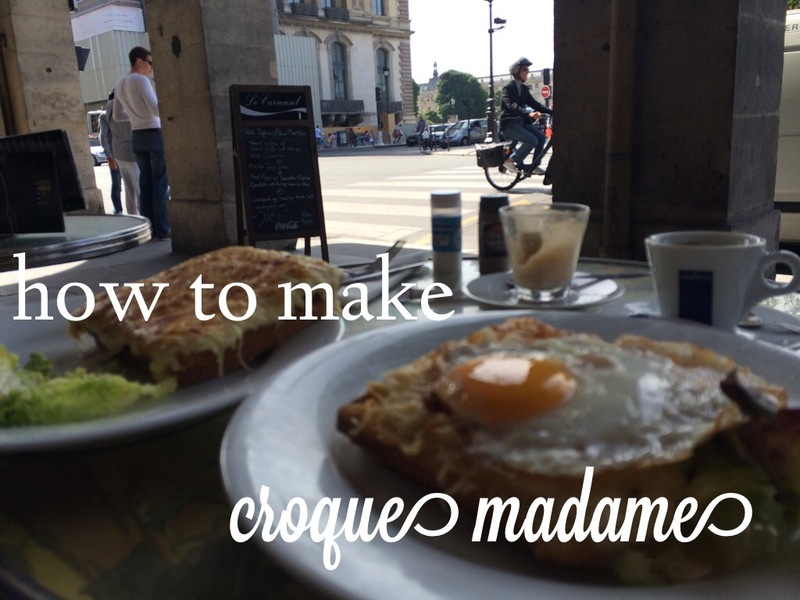 how to make: croque madame! 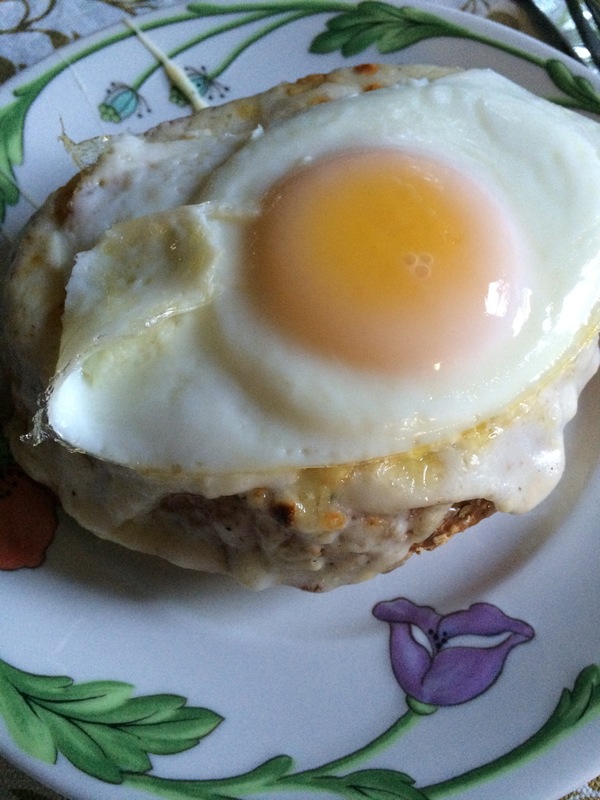 Melty, broiled ham & cheese with a runny fried egg–what’s not to like? When I first went to Paris probably 15 years ago, I did not learn the brilliance of this dish. I may have even turned up my nose at it–no wonder my parents were frustrated! That little girl had no sense, absolutely no sense at all. I’ve now learned my lesson. 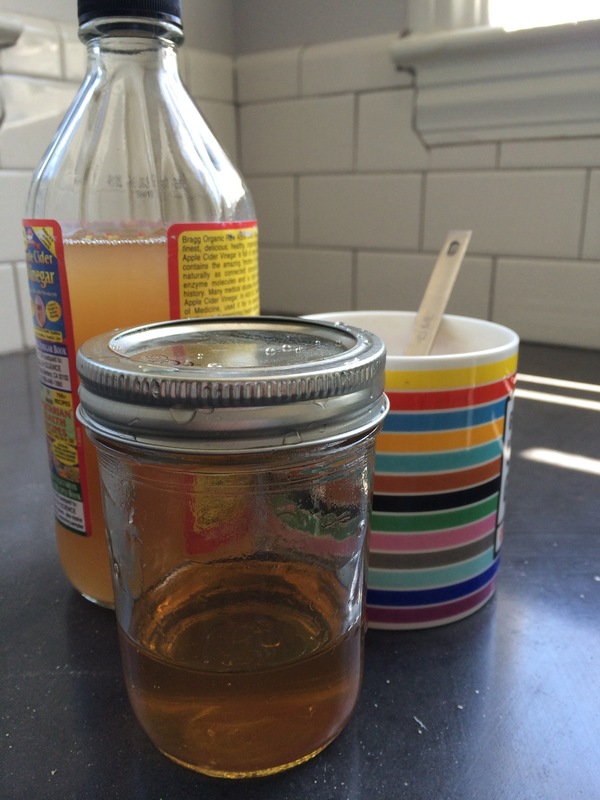 It’s a favorite sick-food of mine, and easy enough both for sick girls and for well-meaning husbands to attempt! 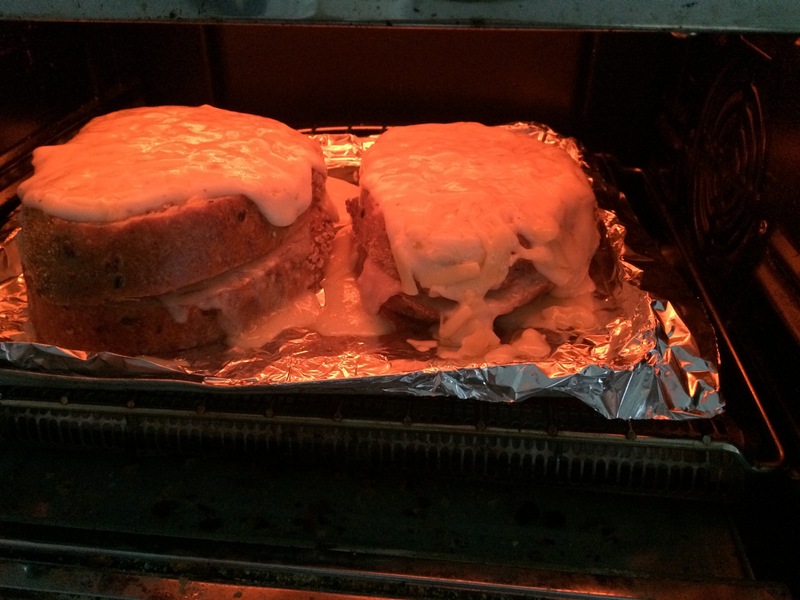 For two sandwiches, melt a tablespoon of butter into a small saucepan (medium heat). Add a tablespoon of flour, and whisk. 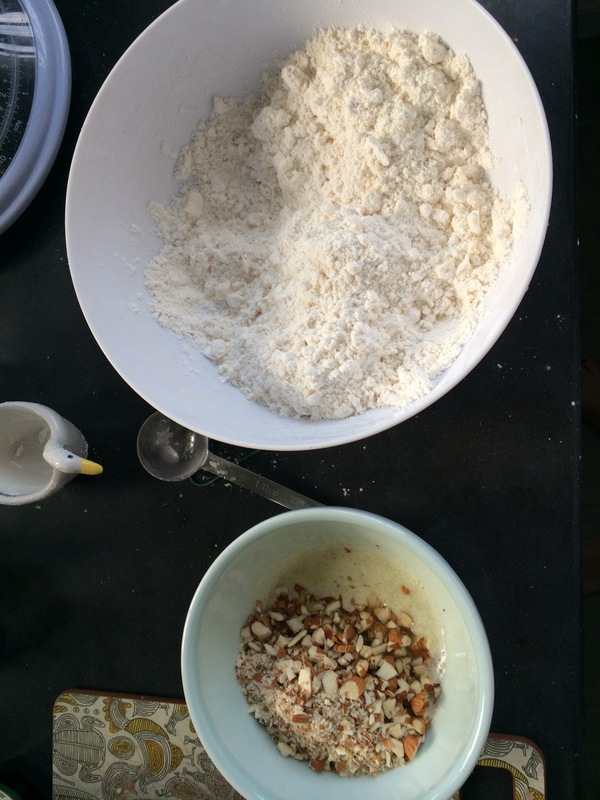 The flour will start to brown–this is good!–and once it’s a nice caramel color, add about 2/3 cup milk and continue whisking. 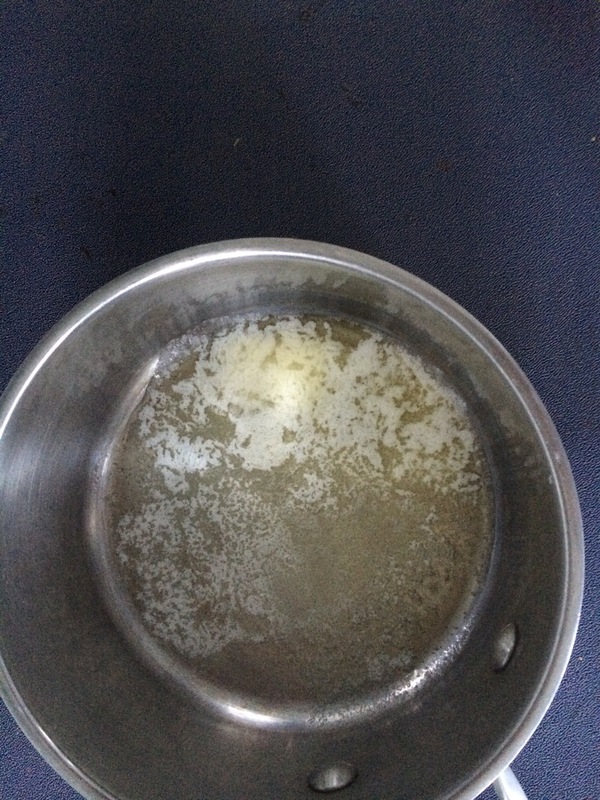 The mixture will thicken, and now, you’ve made bechamel sauce! Congratulations! We’re not done yet. Add a healthy handful, maybe a bit more than 1/2 cup, of a good hard cheese like gruyere, parmesan, or little bits of whatever is in your fridge. Now, you have Mornay sauce. Isn’t that much better? Now, take four slices of bread (the airier the better, as to soak up the sauce), spread two with mustard, and layer a slice or two of ham with a slice of cheese (can be something different–I had Havarti–or the same as above), and top with the other slices of bread. 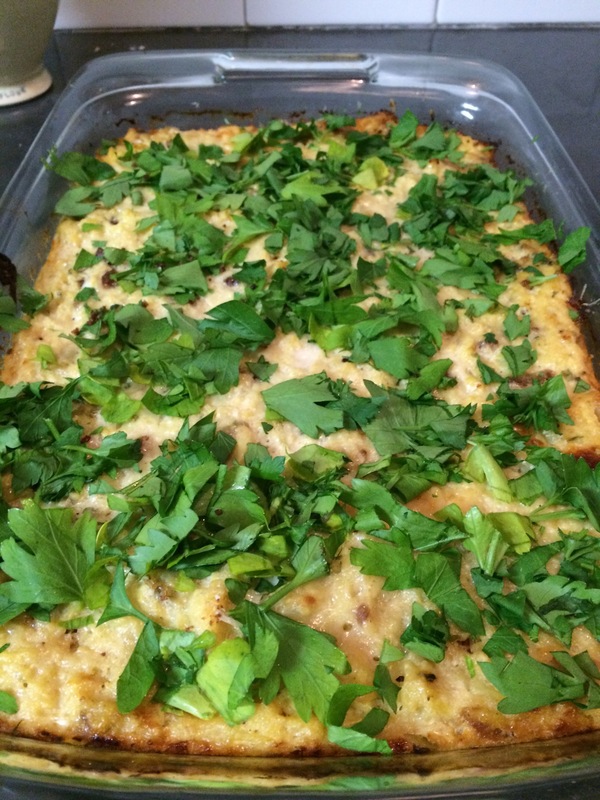 Pour the Mornay sauce over the top, and sprinkle a few tablespoons of grated gruyere on top. BROIL. While broiling, heat up your nonstick skillet and fry two eggs. Once the cheese is bubbling on the sandwiches, take ’em out, top ’em with an egg, and grab a fork & knife–no way to eat this “sandwich” with fingers! Been fighting something nasty this week. Just coming out of the tailspin now. 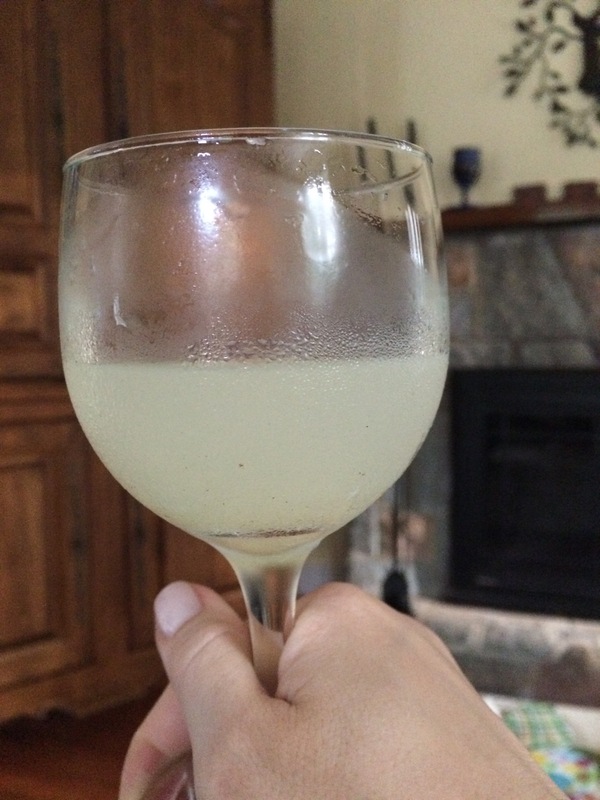 My experience compels me to pass along to you something to help stuffy sinuses and something to fend off aches and pains. Then, when the oppressive virus begins to let up, try my ritual: take a shower and wash your bed linens. Nothing makes you feel alive again like a good hot shower & fresh sheets!